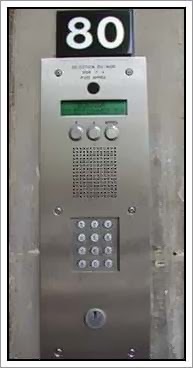 This electronic device you are seeing in the picture is nothing but a door code of our apartment where using a scroll buttons one has to search and select the name and then press “appel” means “call” button which will give a ring to the concerned persons apartment and it is that habitué who will answer that call & unlock the main door. Certain buildings will have only code with rarely names on front doors so without “Le code” you won't get past the outer door which usually leads to a small inner courtyard or a stairway. And then they do have an intercom between the front door and the individual apartments, but most of the older buildings do not. Thus, cipher block at the entrance keeps unexpected and unwanted guests outside. In Paris, friendship without code is inexistent. When you give your phone number to someone that is personal but when you give your front door code that is intimate. Here, most of the buildings are code protected. Actually, in earlier seventies there was a concept of guardian who use to supervise the whole building but now there place has been gradually taken by these door codes just due to cost cutting. Though our building is old but both guardian as well door code is there. In short, in Parisian vocabulary "Just dropping by" doesn't exist unlike those in India.